Celebrations have continued today for UKIP, after the party claimed its first North East success in the European elections. The party secured one of the three regional seats in the European Parliament. Labour took the other two, with the Conservatives and Liberal Democrats losing out altogether. In Yorkshire and the Humber, UKIP increased its tally of seats from one to three, while the long-standing MEP Edward McMillan-Scott lost his seat. A warning: there are flashing images from the start of this roundup from Helen Ford. The Liberal Democrats lost their North East seat in the European Parliament and were beaten into fourth place in the poll. The party's candidate, Angelika Schneider, conceded it had been a very disappointing night. Labour will be sending two North East MEPs to Brussels after Sunday's election result; a rise on their previous one. Jude Kirton-Darling believes her party's European success is partly a result of Coalition policies, which she says are unfairly hitting the region. She also said the rise of UKIP in the North East should not be overstated. The North East now has 2 Labour MEPs and 1 UKIP MEP. See the breakdown of the counting areas across the region here. The long-standing Conservative MEP Martin Callanan has admitted the loss of his seat is 'disappointing'. However, he said the outcome of the European poll was not a fair reflection on the wider state of his party in the region. The UK Independence Party has made the breakthrough it was looking for: taking its first North East seat in the European Parliament. The three North East seats had previously been split between Labour, the Conservatives and the Liberal Democrats. 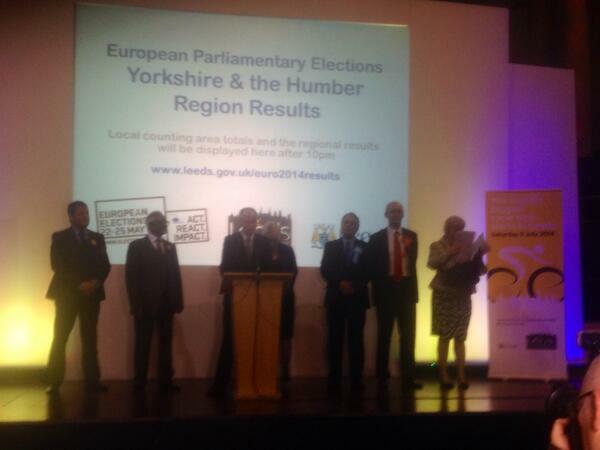 Ukip have won three seats in the Yorkshire and the Humber region. Labour have won two and the Conservatives have secured one.